ThreeSixty Journalism’s TV broadcast camp is back this summer with more media partners than ever. 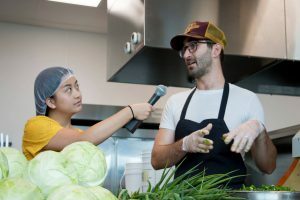 For the second year in a row, ThreeSixty is collaborating with the Center for Prevention at Blue Cross and Blue Shield of Minnesota (Blue Cross) to examine trending health issues with the next generation of reporters. Student campers will spend five days learning from professionals at WCCO-TV, KSTP-TV, KARE 11 and Twin Cities Public Television in addition to former reporters, producers and anchors who now work at University of St. Thomas, University of Minnesota and Padilla. Each camper will have their own reporting coach and videographer, and will learn everything from script writing to on-camera interviewing. Last year’s campers paired up to create “live shots,” but this year, each camper will create their own edited video package. With award winning projects last year, this year’s students will create valuable content about health equity, which will be shared across all partners’ digital channels. The TV broadcast camp takes place July 23-27, 2018 at the University of St. Thomas in St. Paul.